I’m so excited! Yet another blog award came my way this week. It’s the Kreativ Blog Award, and my friend, Adrienne, over at http://mymemoryart.blogspot.com/ bestowed this one upon me. Thanks, Adrienne! 2.) I once had a CB radio, and my handle was “Sunshine”. 3.) Thankfully, I’m not a hoarder. But my mom used to call me a packrat. And I think she was on to something. 4.) My favorite music is 50’s and 60’s oldies. Oh, okay, you can throw in the first couple of years of the 70’s too. 5.) In high school, I took one year of home ec. We learned to sew in that class, and part of our exam was to put a zipper in a dress we had made. While doing so, I sewed the front and back of the dress bodice together. Kreativ sewing, perhaps? Now I’m to pass on this award to a few of my favorite bloggers. Please visit them and tell ’em I sent ya. If I name you in this list, and you don’t wish to participate, please feel no pressure! 1.) Sammy at http://onespoiledcat.wordpress.com/ Sammy’s mom, Pam, and I have gotten to be pretty good internet pals. If you like kitties, you’ll love Sammy’s blog. 2.) Mama’s Empty Nest. http://mamasemptynest.wordpress.com/ I’m a fairly new reader here, but I love her pictures and am always interested in what she has to say . 3.) The View Out Here http://theviewouthere.wordpress.com/ I’ve never met Dee, but I keep threatening to cash in my air miles and fly out to Michigan to visit her and her family…and the Clydesdales! 4.) Patti at A New Day Dawns http://pattisjarrett.wordpress.com/ Patti is a faithful reader and commenter of my blog. We really should try to meet – she only lives about an hour or so from me! 5.) E.C. at http://enjoyingcreating.wordpress.com/ E.C. and I have been blogging buddies for a long time. I can always count on her for encouragement and a sweet comment. 6.) M.J. at http://emjayandthem.com/ I could say the same things about M.J. that I did about E.C. Sweet, supportive blogging friend! 7.) Ellie at Ellie’s Place. http://www.elliesplaceintheworld.blogspot.com/ Ellie gave me the Liebster Award a few months ago, so I’m returning the favor. I read several blogs in addition to these. The reason those blogs aren’t on this list is that either they already have this award, or I know they don’t particularly care for blog awards. But if any of my other blogging friends would like to claim this award and say it’s from me, please do so with my blessing! This entry was posted in Days at Home and tagged kreativ blogger award. Bookmark the permalink. Sunshine is the perfect CB handle for you! Congrats on winning yet another award and thank you very much for passing it on to me and others. Congratulations! I wish I could wear one contact lens and see well – didn’t work! And, yes, I can definitely understand your CB handle – perfect! From CB to blogging. You keep up with the times and apparently the theme is timeless with you. Congratulations on your award. Well deserved. Wow! Thanks for nominating Sam and me for the Kreativ award….that’s so sweet. I’m so happy we met in cyberspace Dianna. Your blog is a highlight of my morning. Congratulations to everyone else as well – I’ll be visiting your blogs soon – any friend of Dianna is a friend of mine (and Sam’s). Congratulations Dianna! Always fun to hear new things about you 🙂 I agree with the others that Sunshine is a perfect handle for you and I do monovision too but I wear two lenses. I’m sorry but the dress thing makes me really chuckle! I will be clicking over to the other award winners, I already read E.C.! Seems you and Aunt Lucille have something in common. Mama said Aunt Lucille once cut out the front of a pair of gym shorts (but back then they were “bloomers”) from the back ! An award richly deserved. Good job. Congrats on the award! I’m excited to check out your winners! 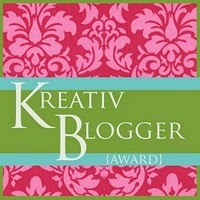 You are very “kreative” and deserving of another blogging award my friend! I love my daily dose of “These Days Of Mine” and through here I’ve found some of the most wonderful blogs. Can’t wait for “down time” this weekend to check out the blogs you nominated that I don’t already know! And (I know this isn’t very modern of me) but I LOVED HOME-EC!! Especially the sewing! Congratulations, Dianna!! You’ve accomplished much in the short time you’ve been blogging. Congrats, Dianna! You have a wonderful blog and you’re very creative with your camera. I’ll be checking out your nominees when I have more time. Have a wonderful weekend! One eye for the sunrises/sunsets far away, one for the blog up close… a winning combo!! 😉 Kongrats!, the award list over there continues to grow .. ! Dianna, even though we’ve just recently become acquainted, I think Sunshine fits you perfectly!! I love sunshine, it makes me happy and you know what? Each day when I visit your blog and see your photos, I get a little ray of sunshine. And Kreativ you are, with a K or a C! You also bless me with the nicest comments, so thank you! Thanks also for bestowing the Kreativ Blog award on me. (I’ll try to live up to the title! 😉 ) Can’t wait to go visit the other blogs you named too. Congratulations! Your award is well deserved and well earned. Thanks so much for presenting me with the award. I’m so flattered. I’ll make a post for it soon. I’m going to visit the other folks on your list, I don’t know most of them. Congrats! Your blog is always fun and I love your photos–well deserved. I can’t sew. I’m actually quite embarassed that my husband takes his mending to his 83-year-old grandmother! Glad to know I’m not the only one. Good job Dianna. I like many others love your blogs! They are pieces of sunshine too!!!!!!!! !